Whatever you might like to create, we are here to make your programming idea a reality. We can teach you audio recording and engineering, audio editing, and even show you how to run a live radio show. We look forward to helping you make it happen! 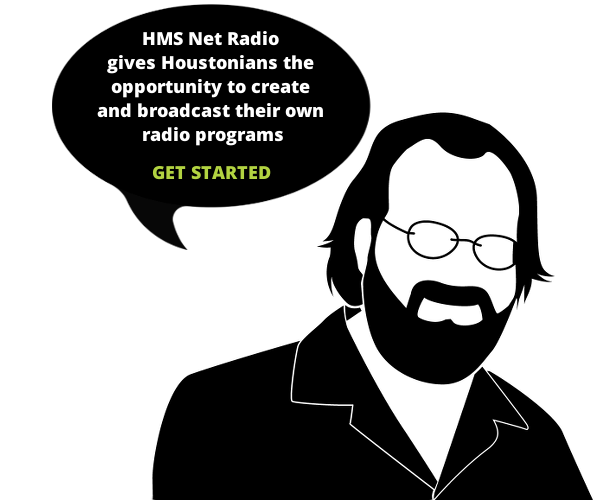 Tune in Saturdays at noon for Circular Stories, a new addition to the HMS Net Radio lineup. Each week, host Roz Wyatt explores topics including the circular economy and sustainable business development. Please contact HMS Net Radio Program Director Ronnie Renfrow to arrange an orientation session. During this meeting, Ronnie will customize a training program that will enable you to bring your program to life. Email ronnier@hmstv.org or call (713) 524-7700 X 121.